I spent much of last week soaking in all the inspiring developments in the Python community at Pycon 2012. A huge thanks is due Jesse Noller @jessenoller and his team for organizing an engaging, well-paced conference and for executing it flawlessly. Impressive. I played a small part with a Poster Session on Sunday, the final session day. 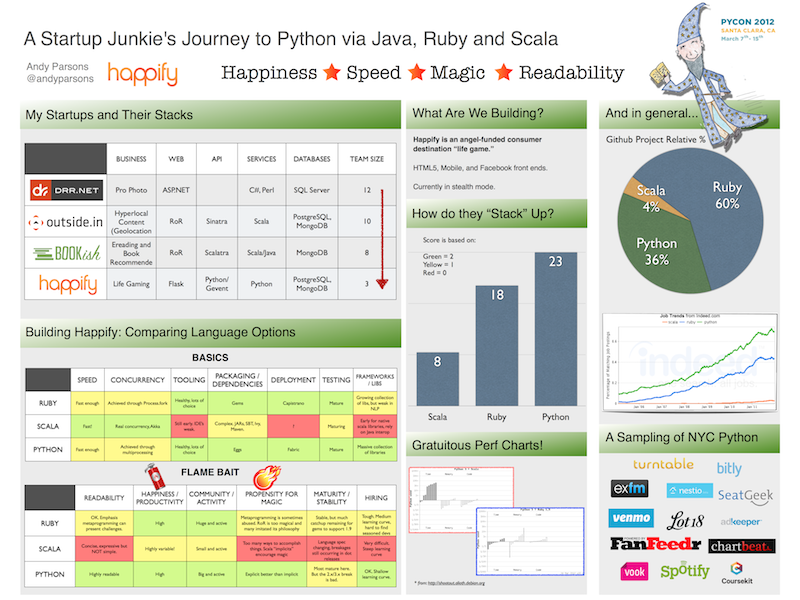 I talked about how and why we arrived at a Python codebase for my new project, Happify. My poster, below, is an unscientific look at various startup-friendly languages across axes like hiring, readability, produtivity, and performance. I spoke about the state of the NYC startup scene, how Python is on the rise, and why it’s a particularly good fit for small teams that require each member of the team to contribute at every layer of the stack. It was very well-received, sparking some vibrant post-session conversations on everything from Positive Psychology to creative use of Python decorators. My short intro video is here. You’ll see clearly I’d had insufficient sleep ond more-that-sufficient caffeine. But the best aspect of Pycon for me was getting to know the community of folks that make the language thrive. For years I have been intrigued by the differences between various self-organizing open-source technical communities, with first-hand knowledge of the groups driving Ruby, Python, Scala, Java, and PostgreSQL. I have in mind a long post which will explore their similarities and differences, but I will pen a few words about Python here. Python has a long history as a utilitarian “get things done” language. It’s wide adoption by academic and scientific programmers, as well as the web application startup scene has proven that its readability, lack of magic, and productivity are important to anyone writing code. Perhaps even more important than out-of-the-gate performance and concurrency. This cross-cutting eye toward utility is very clear at Pycon. Talks and Posters surrounding my own included explorations of computer vision, artificial intelligence, asynchronous evened programming, web frameworks, and even my favorite “Militarizing Your Backyard with Python: Computer Vision and the Squirrel Hordes.” Get the language out of your way, and you can do anything from shooting rodents to making people happier through gaming. Anyway, I’m excited to be a small part of the Python community. I am excited to be in Santa Clara this week for company business and for PyCon 2012. In recent years I have seen a tremendous lift in the size of the Python community and the innovation coming out of it, and I am thrilled to be a part of it. On Sunday I’m giving a “poster” presentation on this very topic; I’ll be engaging with the community here on why a Python-based stack is the right fit for our efforts at my new startup, Happify. Beyond the obvious energy and creativity coming out of Python, my thesis is that NYC is becoming a center of great Python work in startups. Thanks to open-source frameworks like Brubeck.io, a growing talent pool of xooglers and Bay-area expats, and the sheer number of funded early-stage companies embracing Python (for it’s readability, productivity/fun, and good-enough performance), it is a natural and solid choice for NYC startup efforts. I am jazzed about becoming more involved with the NYC Python scene and contributing wherever I can. If you are at PyCon, please say hi. I’ll post about my experience here when I am back in NYC.